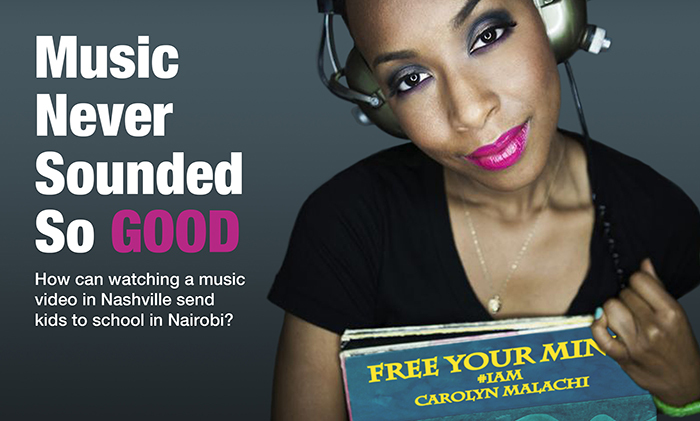 Corporate sponsors will pay The School Fund 19 cents (one class hour), every time viewers watch the new music video of "Free Your Mind" by Grammy-nominated indie-jazz musician Carolyn Malachi. The money goes directly to schools in Tanzania. You can be the first to view the video, filmed on the streets of East Africa and downtown Washington, D.C., here. In the hills above Iringa, Tanzania in East Africa, a 17-year-old orphan named Kandida walks 30 minutes to school. She's lived for nine years as a guest in her aunt's home with her brother and five sisters, but at her desk at Lugalo Secondary School she gets to dream of becoming an engineer. Kandida has no idea that nearly 8,000 miles away in Washington, D.C., a 28-year-old woman named Carolyn is singing her heart out on her behalf. These two haven't yet met, but Carolyn believes that if she sings loud enough Kandida surely will hear her message. Kandida's page includes school receipts for and two-way dialogues with her supporters. Carolyn Malachi, whom I wrote about here, will release the "Free Your Mind" video as a tool in her education-fundraising "IAM Campaign" when she performs live onstage on December 6th at an awards ceremony for the Business Civic Leadership Center (BCLC), a corporate-social-responsibility nonprofit that's affiliated with the U.S. Chamber of Commerce. Just as BCLC unites commerce with compassion, Carolyn yokes art with education -- music with a mission -- to keep students like Kandida in school. Teaming up with The School Fund, an online crowd-funding community that connects global funders with low-income secondary students, "Carolyn brings both vision and action to help improve societal challenges," says Catherine Keller of BCLC. The Washington Post says, "As ambitious as she is at setting goals, Malachi matches that making music [that's] overflowing with ideas... a slinky slice of neo-soul." Tapping out African gumboot rhythms with D.C. dance troop Taratibu Youth Association, Carolyn will perform a fresh set from her upcoming album, including "Free Your Mind." Telling the story of MoJo, a young dancer who shows up late to rehearsal, falls behind and struggles to learn the new choreography, the "Free Your Mind" video tracks her transformation as the girl shifts everything around her and moves what's inside her. "The dancer is a metaphor: Maybe you're like her... It's very high-energy," says Carolyn, "with vivid scenes of urban murals, loud graffiti, dancing tree leaves and above -- clear, blue sky." Matt and Carolyn believe that music can fuel education funding around the world. She'll pull onstage "the partner of my dreams," Matt Severson, who started The School Fund at age 18 with cash from his own pocket -- $150, the average global cost of a year in secondary school -- for a 14-year-old friend he met on vacation in Tanzania. Now, Matt's a Brown University alumnus working at Google, John's a college student in Uganda and The School Fund is a 501(c)3 nonprofit serving 276 students through 24 local partners in 13 countries. 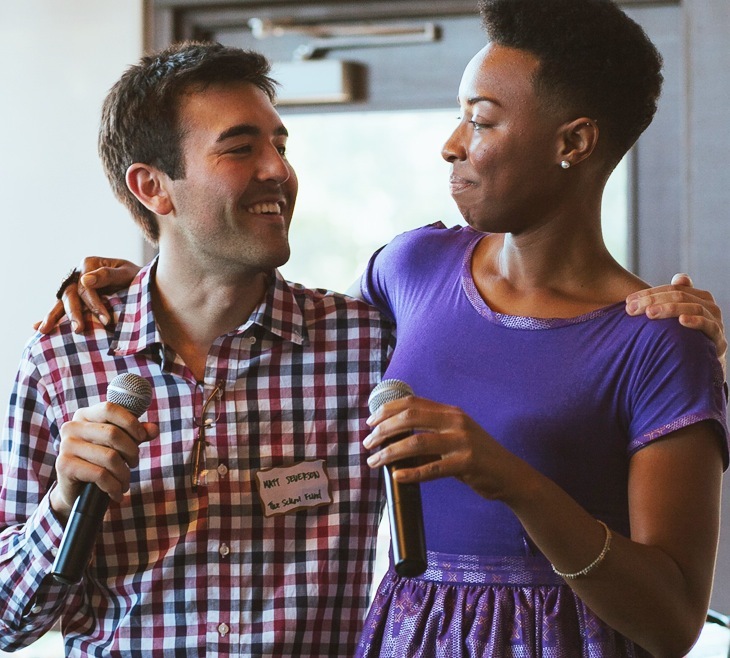 Matt and Carolyn's "IAM Campaign" combines five cross-sector players collaborating for education: musical artist, U.S. nonprofit organization, corporate donors, in-country schools and individual donors. "The School Fund's using their digital platform to do some good: not just to distribute information but to share communication," explains Carolyn. "What I love about Matt and The School Fund squad is that everyone is so passionate about what they're doing. They see what they're doing as an art form. I feel like I'm working with other artists." However, Matt sees Carolyn as "not like other artists, who can be self-centered -- she's completely genuine and selfless," he insists. "There's no doubt she's a tremendous artist who's about to take off. But, she's also got a really good business mind and she cares about making this world a better place, not just augmenting her own brand or bringing attention to herself. The 'Free Your Mind' video is all about believing in yourself, making the world what you want to see. Her work matches our mission at its core." The two hope to "change the way people use their platforms -- and we all have platforms now," Carolyn proclaims. "We want to be the Facebooks and Googles of our industries. We see ourselves as start-ups. We're small, but we have some fresh ideas that are about to take off." To raise 10,000 hours of classroom time each month for students in East Africa. To mobilize other musicians and nonprofits into small acts, from crowdfunding a few dollars to clicking on a music video, for good. 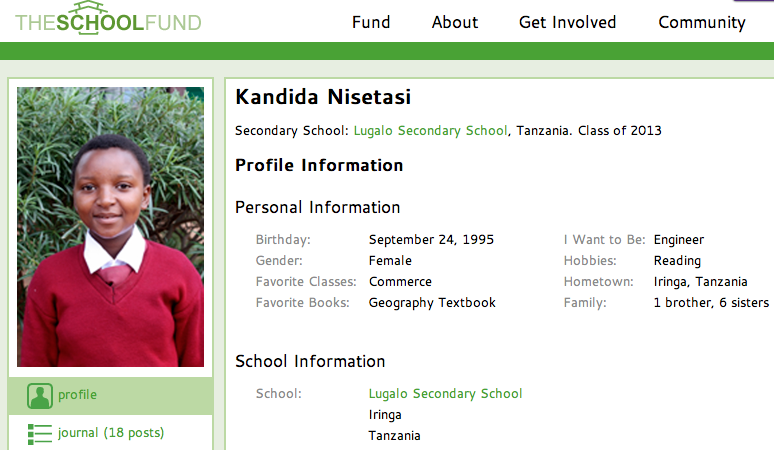 , it's conceivable that The School Fund's students in Africa could view it and, thus, fundraise for their own schools. Carolyn wants to reach this audience most of all. "Being a black woman and part of the African diaspora, I wanted to, as we say in my family, touch home with this video. When our students see it, I want them to know that maybe life is really tough where you are... But I want you not to give up, to clear your head and find a way through. See the distractions, what's in the way, and move through them. Rise above your situation and life will be different." Carolyn announces the "IAM Campaign" and her goal to fund 10,000 hours of school per month. For Carolyn, Matt and The School Fund's first high-school graduate, John, life already is different. "All great accomplishments begin as thoughts," smiles the basketball-playing, African-dancing, American girl who's singing her heart out for a future engineer in Tanzania. "We have to think something and believe it for it to be." Sneak peek for you below: Beginning December 17, you can view the video at The School Fund/I AM or Carolyn Malachi's YouTube channel, and with each click you'll rack up those classroom hours for students in need. Photos courtesy of Carolyn Malachi.